This mod changes the Brothehood T-51b and Brotherhood T-45d power armors so that they do not act as a disguise, so NCR troops will not attack you while wearing it. My first mod, makes two tiny changes to some armor. 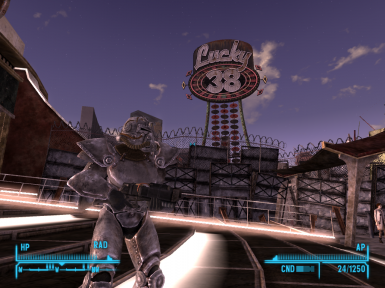 To make sure this mod works, you MUST NOT BE WEARING BROTHERHOOD POWER ARMOR when you first use this mod. This mod changes the Brotherhood T-51b and Brotherhood T-45d power armors so that they do not act as a disguise, so NCR troops will not attack you while wearing it. It's mostly a personal preference thing, as you get a lot of Brotherhood T-51b power armor while doing the brotherhood quests, and regular T-51b armour is rather rare. If you wan't this to fit in with the canon, I guess you could say that the only difference between the regular and brotherhood armors is the tiny hard to see brotherhood logo on one shoulder, and people 50 meters away are not going to be able to see that and start shooting at you because of it. It is not going to be compatible with any other mod that changes Brotherhood power armor.